JCB Pioneer: Mars drops you onto the surface of The Red Planet. Your mission: To survive and prepare Mars for future human colonisation. Experience incredible survival sandbox gameplay and explore Mars using a selection of futuristic, ultra-rugged JCB vehicles designed specifically for the challenge. Mine precious materials, construct large-scale buildings and research new technologies to ensure humanity’s future lies beyond planet Earth. Team up online with other Pioneers to expand your base and earn special rewards. JCB Pioneer: Mars brings the harsh reality of the Red Planet to life with detailed high definition graphics, vehicle physics and weather effects from Unreal Engine 4. 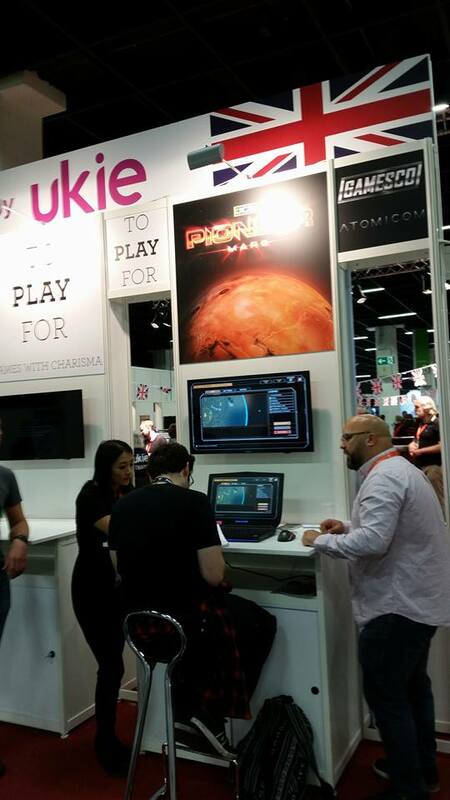 We had the chance to find the developers of JCB Pioneer at Gamescom 2017 and chat with them about the game while also trying it out. First and most interesting fact we found out was that the game was going to be an MMO but it ended up costing too much to do something that big. “It is a smash-together of two genres, survival and city building,” the devs explained before continuing to talk about how we are able to colonize Mars while going through things like storms and other natural obstacles in our playthrough. You basically start from scratch and end up being at the point where you have a lot of things and you are caring for other people’s survival. Much of the game is very scientifically accurate by the way as the development team has employed the help of an astrophysicist was who also present there to tell us quite a few things about it. Many of the things that we will see in the game were actually based on things that the Mars Reconnaisance Orbiter, HIRISE, took pictures of while its traversing of the Mars landscapes. “It is quite a struggle to get everything scientifically accurate,” we were told. Things that hurt you for example might not even be there in reality. The devs told us that it was really fun to be able to work back and forth when it came to trying to add fantasy to science and in the end of the day, the single player experience that they were making would end up having a whole lot more substance than they first expected it to have. Also, apart from all the single player features that would be in the game, can always expand into multiplayer since a lot of multiplayer features were already in the game to start with. “Some might want a non-player experience but at the same time we want to enable people to play it as a multiplayer at some point,” they told us while continuing to explain how they want it to be a community-driven effort. Early Access buyers will be buying a polished product from what we were told and that is a good promise to keep a developer to. The game is planned to come out on Early Access early next month. You can learn more about JCB Pioneer through the game’s Twitter, Facebook and website.